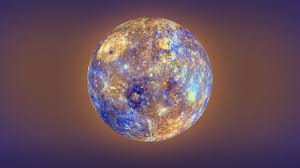 Mercury helps to develop the mind. One takes right decision due to Mercury. Mercury also denotes about speech. Weak Mercury creates speech problem. One might face losses due to speech problem. One face mind related problem due to weak or corrupt Mercury. One get fever and stomach related problem. One cannot save money due to weak Mercury. One gets stress in job. One also get skin related problem. Weak Mercury creates problem in getting child. One cannot get position due to weak Mercury. When Mercury is in seventh house then life partner would be good for nothing. One face many problem in business due to weak Mercury. A person would be scholar if Mercury is strong. One can use mind in proper way when Mercury is in good condition. One becomes good lawyer, astrologer or singer due to good Mercury. There are many problems due to weak Mercury. One always face debt due to weak Mercury. A person cannot make proper use of money. A person cannot make business on large scale due to weak Mercury. One might becomes victim of trickery. Wear steel or iron ring in little finger on Wednesday. Touch pottery urn to water and donate it to any need person. Do this on Wednesday. Make nose piercing of wife, maternal aunt or daughter and donate silver. Worship goddess Durga to strengthen Mercury. Wear yellow color thread on Wednesday. The child power of boy-girl would be less when Mercury is corrupted. The child’s mind would not be sharp. They don’t have good knowledge of mathematics, language and art. If Mercury is weak then child’s teeth would be weak. One cannot understand difference between fragrance and stench. Child may suffer with skin and breathing problem due to weak Mercury. Clean your teeth with alum on Wednesday. Feed birds and fishes. Keep solid iron ball with you. Do not intake alcohol, non-veg and chili. Weak Mercury creates speech problem. One faces many problem due to speech problem. Balance person gets progress. There would be cuts on tongue, ulcers on throat or tongue due to weak Mercury. There would be whiteness on tongue. There would be difficulty while singing. People go away from you. Weak Mercury impacts on throat. There would be heaviness on voice. One faces many problem relating to throat. One also face cough and thyroid problem. The voice would be problem in voice. One cannot speak words properly. One cannot get happiness from aunt. Serve 8 year old girls. See your face in mustard oil and donate it. Flow copper coin in flowing water on Wednesday. Intake brahmi. One can drink mattha. This makes voice clear and sweet. Do not keep birds in cage. Serious gas problem, spots in stomach and mouth ulcer occurs due to weak Mercury. There would be muscles problem. One faces stains and spots on skin. Skin become dry and itching occurs. Teeth remains unstable. There would be pain in chest. One get headache when mind starts working. Keep sugar in pottery and hide it in secluded place. Keep honey in pottery and hide it in secluded place. Store first rain water and keep it on terrace. Put milk in pottery and keep it on terrace for 11 days. This avoids restlessness. Donate red masur lentil to need person on Tuesday. Hide red masur lentil in cemetery on Tuesday.